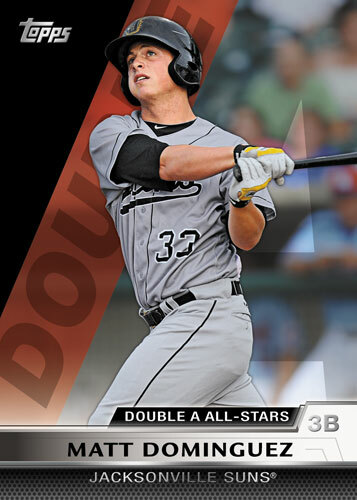 Unlike its Freshmen release which was divided into two different series, 2011 Topps Pro Debut Baseball will be sold as a single series, 330-card set. Topps will be packing more value into this year's product as well, with each 24-pack hobby box of 2011 Topps Pro Debut sporting 2 autographs, 2 relics, 8 parallels and 18 inserts. 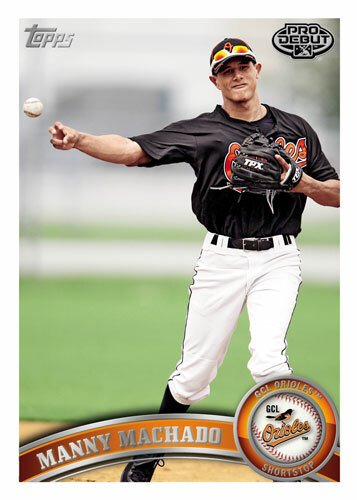 Features full MiLB License (Minor League Baseball) like last year. 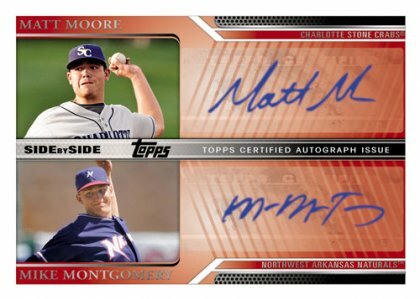 New Side-by-Side dual prospect autograph cards! Parallel system: Red (1/1), Gold (/25), Blue (/199) and Printing Plates. 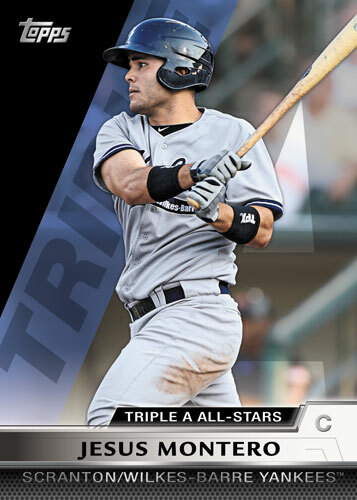 Insert sets: Single-A All-Stars, Double-A All-Stars and Triple-A All-Stars. 20 player relic lineup featuring MiLB logoman cards (1/1s), Red patches (/5), Red relics (/5) and Gold jerseys (/50). 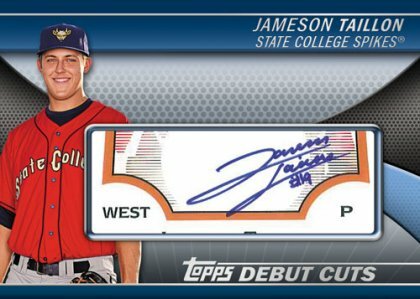 Debut Cuts Return:AFLAC cut signatures highlighted by Pittsburgh Pirate's hurler Jameson Taillon! Early Autograph Lineup:Mike Moustakas, Michael Choice, Josh Vitters, Cito Culver. 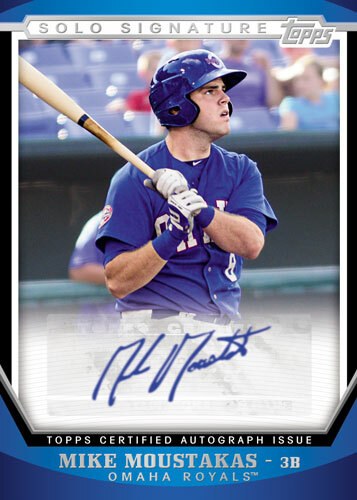 Early Names on the Dual Auto Checklist:Dustin Ackley, Manny Machado, Mike Moustakas, Mike Montgomery, Matt Moore. 2011 Topps Pro Debut Baseball Hobby Box - Factory Sealed! (2) 2011 topps pro debut CHRISTIAN YELICH (brewers) rookie lot HOT!! 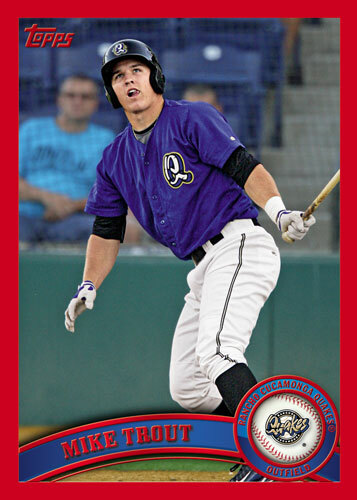 Good: Love the base set to collect minor league players in minor league uniforms. The low numbered parallel colors also provide scarcity for players that could become future greats. The relic cards are enjoyable too. Bad: Compared to Bowman products, the auto checklist is weak. 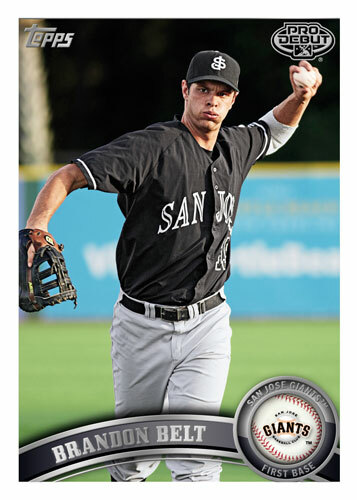 Also, with Bowman and now Topps Heritage Minor League Baseball, it is difficult to grasp the purpose of this product. The Bottom Line: If you want a product that does a good job of representing the minor leagues, this is your product. 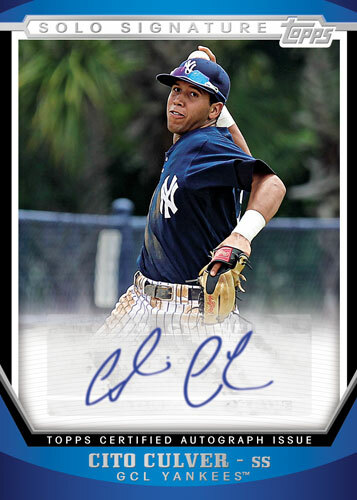 If you are more looking for autographs of the up-and-coming players, the market seems saturated, and 2011 Topps Pro Debut is at the bottom of the heap. The base set design is great. While some have complained that it is too similar to the 2011 Topps Series 1, to me this choice places the minor league product almost on an equal footing with its Major League counterpart. And this is what the product should be about—a celebration of the minor leagues. I love the focus on minor league uniforms, and the photography does a great job of catching the players in action poses while capturing the homey feel of the stadiums. The relic patches are assembled, obviously, from the minor league uniform, which gives your collection more variety and color than a collection from just the 30 major league teams. The three parallel colors (Blue #'d/309, Gold #'d/50 and Red 1/1) will also give some lucky collectors some rare cards of great Minor Leaguers, and potential future Hall of Famers. The autographed card design, on the other hand, is not that impressive. The autos are stickers, and some, especially one of the hits I pulled, are crooked. The base set checklist is loaded, and if I only had to score this checklist, I'd give it a 4.9. Eric Hosmer, Jameson Taillon, Shelby Miller, oh yeah, Bryce Harper, and dozens of other great Minor Leaguers. With the limited number of parallel colors, this could be a good product to load up on rarer cards for future Hall of Famers. Also, because this is a hobby only product, could be a good chance to get a rarer Harper card in his Harperstown, I mean Hagerstown, uniform. The auto checklist is not stellar, and looks to be a repeat of quite a few Bowman autos. Sure, you have a chance of pulling a 1/1 Harper…ok, you don't. But it's there. Also, the set contains AFLAC cut autos, which makes me wonder, why not just use the AFLAC cards themselves rather than cut them up? Much like going to a minor league game, Topps Pro Debut is less expensive. For its price, it's a good product. It's also priced well below Bowman, and delivers two autos and two relics per hobby box. It pains me to say, but I'd rather have the patches and the base set from this product, than the autos. Seeing a product celebrate the minor leagues is great. Most times I enjoy minor league ball games more than major league games, and this product captures that feeling. I also don't remember a product where I was so entertained by the base set with the variety of teams and uniforms. It surprised me that I enjoyed this product as much as Bowman 2011 this year, but for different reasons. And maybe that's where this product fits into the minor league market. 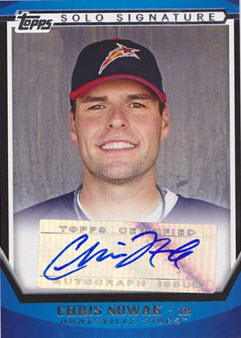 You buy Bowman in the hopes of the auto; you buy Topps Pro Debut hoping for everything but the autos. 2011 Topps Pro Debut #53 Christian Yelich Rookie Card Marlins/Brewers RC Hot!!! 2x 2011 Topps Pro Debut HOBBY Pack (Bryce Harper 1/1 Cut Auto Mike Trout Gold)? BRYCE HARPER 2011 Pro Debut Hagerstown Suns ROOKIE Rare Multi Ad RC PHILLIES. This product is just average. I’ve opened 8 boxes now and although I expected some duplicates, the amount of duplicates within the jersys and autos is disturbing. It doesn’t seem to be the kind of product for “turning over” for profit. I’ve got my common set, maybe 2 and a complete set of jerseys but I had to buy about 6 of the jerseys to complete. Not as good as last year. No cut signatures also and last year’s boxes yielded about 2-3 cuts in 8 boxes…along with the other 2 sigs. This is a fairly mediocre product. I’m a prospector, and I’d prefer if there were MLB logos rather then the MILB logos. The cards didn’t look as clean as last year’s product, and the inserts were fairly boring. The only upgrade on last year’s product was the fact that there are 4 hits per box instead of 3 like last year.